The Metabo STEB 65 Quick Jigsaw has an adjustable pendulum stroke with 4 settings and Vario Electronics, for working with customised strokes for the materials used. 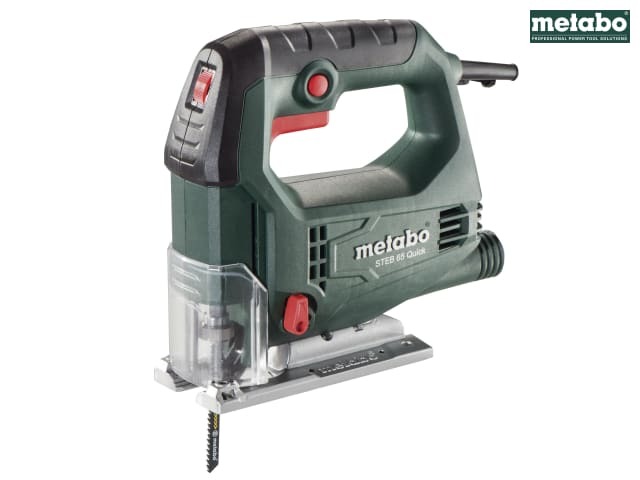 The Metabo Quick function allows for the blade to be change without additional tools. It has a light weight, compact top handle design with a non-slip softgrip surface. The shaving blower function and dust extraction port keep the cutting line clear and free from debris. Supplied with: 1 x Hexagonal Wrench, 2 x Blades and 1 x Plastic Carry Case. Strokes at No Load: 600-3,000/min. Capacity: Wood: 65mm, Non-Ferrous Metals: 18mm, Steel Sheet: 6mm. Swivel Range: + 45°/- 45°. Non-Ferrous Metals: 18mm, Steel Sheet: 6mm.